Bittersweet: Why I am taking time off. Many of you may know we are expecting another baby. She was a surprise but we couldn’t be happier. Our 3 year old is going to be such an awesome big sister. Yesterday we got some unexpected news that has changed the course of my pregnancy. I need to rest as much as possible for the rest of the pregnancy, along with other “fun” things ahead. I’m telling you this because I’ve decided to take time off from Frugal Day. I’m not going to be able to interact with my daughter the way I normally do and I want to spend as much time with her as I can before the baby is born. Frugal Day has been a huge project for me and it’s really hard for me to walk away even for a short time. I’m sure you’ll see me on here from time to time but for now I have to focus on my family. You can always find me over at No Thank You Please for updates. If you are looking for another great frugal blogger make sure you visit Julia, The Frugal Find. She is an amazing person and a great resource for frugal deals. 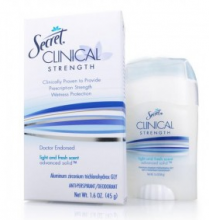 Head on over to Facebook and get a coupon for $1/1 Secret Clinical Deodorant. For every coupon redeemed, Secret will donate $1 to PACER’S National Bullying Prevention Center. What an awesome way to save and give back! This might be “TMI” but ever since I found out I am pregnant, this is the only deodrant I will buy! So glad to see the coupon. I’ll hold onto it until I can get a great deal at the drugstores! Yay! Juice in the City has launched their “Everywhere” deals. Now everyone can take advantage of some of the best offers around. Today they have a great deal if you are looking for high quality stationery, invitations, holiday cards and more. I came across Paper Culture at BlogHer and love them! Letter pressed cards are a huge favorite around here but they can be pricey. I’ll be one of the first to by this hot deal. Get $20 for $50 to Paper Culture with the JITC Everywhere deal! Have you signed up for JITC yet? Don’t wait, it’s free and easy. Sign up here now! We’ve had a lot of change over the last three weeks. 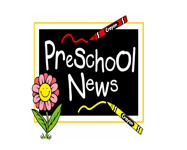 My sweet little baby started pre-school. We’ve been home together for almost three years. Sure she’s participated in play dates, soccer, and other activities but nothing prepared us for this transition. Our daughter is very sweet, shy, and loves to be around me. As I do her. But I know she really needs more social interactions with kids her own age. After three weeks, yesterday was the first day that I left her. There were tears for both of us. I came home thinking I was going to get so much work done. Instead I sat and stared at my phone, waiting for the call to come back. I didn’t get a call. She was fine. When I picked her up, she excitedly told me about her day. My heart just overflowed with love and pride. I’m telling you this because I know posting has been hit and miss lately and I haven’t been able to respond to all the emails that have been coming in. I think we can expect that for a couple more week. But you’re all still here! In fact, our numbers are awesome and I’m thrilled. Without you, Frugal Day wouldn’t exist. Thank you for continuing on this journey with me and our life as we know it! Razors are one of those items I get for free or almost free at the drugstores. It’s with these kind of coupons that make that price possible. 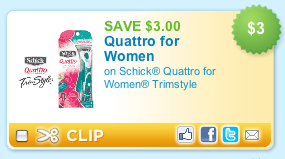 Grab your Schick Quattro Razor $3 off coupon now before it’s gone. This one will go fast because people like me are grabbing them up! If you don’t see it, use 94127 as the zip code. I debated whether I should post about my friend Brandi and her family here. I value each and every person that comes to Frugal Day, and I don’t want to take advantage of any reader. But I thought about it more, and I know this is exactly the place I need to post it. If you can help Brandi and Luke in any way during this incredibly tough time this holiday season, please do. 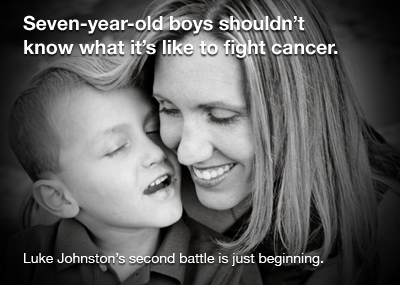 You can learn more about Luke and Brandi in this post I wrote on our family site.